In the nineteenth century, most free people who left the South migrated to the northern states in search of a better life. They clustered in small communities in the larger cities and helped establish the Black urban North. During what is known as the First Great Migration some 1.5 million Black people moved north between 1916 and 1930. 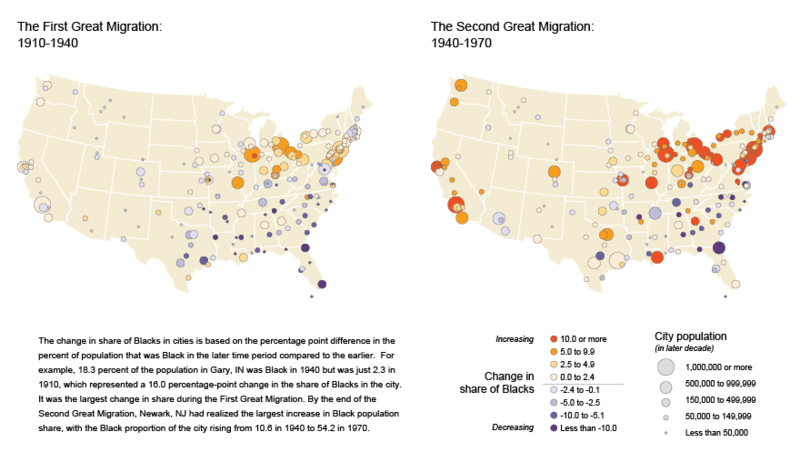 The Second Great Migration, between 1940 and 1970, brought 5 million Black Southerners North and West. NOTE: Data are from decennial censuses, 1910 through 1970. Population counts are based on unrevised numbers. Data for the Black population for cities in Alaska and Hawaii were not available in 1940 or earlier decades. Cities shown are those that were either in the top 100 cities in the country or top 3 of a state and had a Black population of at least 100 people. These criteria were placed on 1940 data for the First Great Migration and 1970 data for the Second Great Migration. By 1970, 47 percent of the nation’s African Americans lived outside the South, and more than 80 percent were in urban areas. 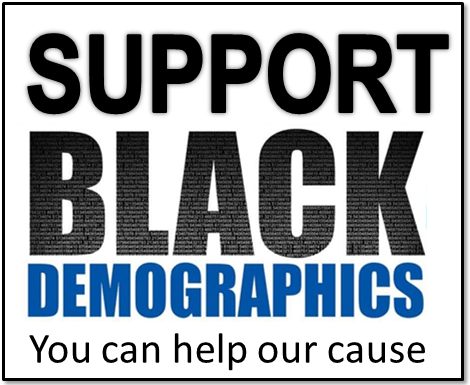 That’s when the migration patterns reversed and Blacks began returning south in large numbers. As they returned south, many followed the same paths that their predecessors used when they migrated north. Theses routes were along the old railroad routes: from eastern cities toward the Carolinas; from Ohio and Michigan cities toward Alabama; from Chicago toward Mississippi; and from Los Angeles toward East Texas. Although some African-American migrants were returning home, many were actually born in the North and were seeking economic opportunities rather than familial ties. They headed in large numbers for rapidly growing metropolitan areas such as Atlanta,Charlotte, Dallas, and Nashville. 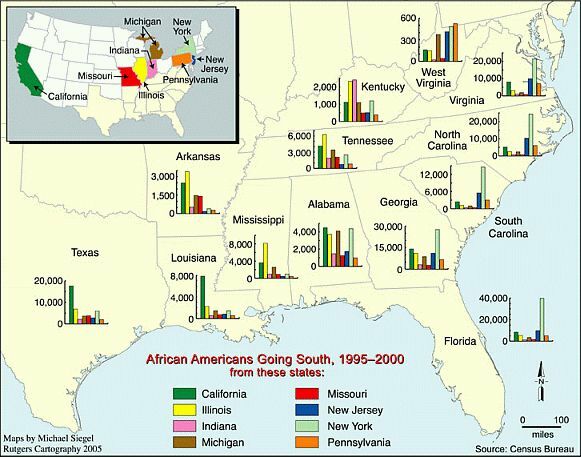 The map below shows the migration patterns from the northern states and California to The South between 1995 and 2000.